Excellent podcast! Love hearing the current events in AI. AI has been described as “Thor’s Hammer“ and “the new electricity.” But it’s also a bit of a mystery – even to those who know it best. We’ll connect with some of the world’s leading AI experts to explain how it works, how it’s evolving, and how it intersects with every facet of human endeavor. This podcast is produced by NVIDIA, the AI computing company. Multiple episodes are released every month. Robots can do amazing things. Compare even the most advanced robots to a three-year old, however, and they can come up short. UC Berkeley Professor Pieter Abbeel has pioneered the idea that deep learning could be the key to bridging that gap: creating robots that can learn how move through the world more fluidly and naturally. We caught up with Abbeel, who is director of the Berkeley Robot Learning Lab and cofounder of Covariant AI, a Bay Area company developing AI software that makes it easy to teach robots new and complex skills, at GTC 2019. UC Berkeley's Gerry Zhang talks about his work using deep learning to analyze signals from space for signs of intelligent extraterrestrial civilizations. And while we haven't found aliens, yet, the doctoral student has already made some extraordinary discoveries. Not sure who will win the NBA playoffs? Looking for coaching when putting together your fantasy football team? Swish Analytics uses AI to help you pick winners. Corey Beaumont, co-founder and head of engineering at the startup, explains how Swish Analytics takes the same kind of mathematical models lenders use to assess whether a borrower is a good risk and applies them to the $1 trillion sports betting market. GOAT Group helps sneaker enthusiasts get their hands on authentic Air Jordans, Yeezys and a variety of old-school kicks with the help of AI. Michael Hall, director of data at GOAT Group explains how in a conversation with AI Podcast host Noah Kravitz. You probably recognize the name Nuance from their work with speech recognition and virtual assistant technology. They’re one of the pioneers of voice recognition technology. Of course Nuance Communications has gotten into AI, but what you might not know is they’ve also gotten into using AI to chart the course of the healthcare industry and how physicians can use artificial intelligence to make people healthier and make their work better, Karen Holzberger is the vice president and general manager of Nuance’s Healthcare diagnostic solutions business. At some point in life, every man faces the same great challenge: sorting out his children's Lego pile. Thanks to GPU-driven deep learning, Francisco "Paco" Garcia is one of the few men who can say they've conquered it. Here's how. You don't need to be an an academic or to work for a big company to get into deep learning. You can just be a guy with a NVIDIA GeForce 1080 Ti and a Generative Adversarial network. Jason Antic, who describes himself as "a software guy," began digging deep into GANS. Next thing you know: he’s created an increasingly popular tool that colors old black-and-white shots to make them look good. Interested in digging into AI for yourself? Listen and get inspired. SoundHound made its name as music identification service. Since then, SoundHound has become much more. It's leveraged its 10 plus years in data analytics to create a voice recognition tool companies can bake into any product. Here to tell us how SoundHound has grown into a major player in voice driven Ai is SoundHoud VP of Product Marketing Mike Zagorsek. With “Fake News” embedding itself into, well, our news, it’s become more important than ever to distinguish between content that is fake or authentic. That’s why Vagelis Papalexakis, a professor of computer science at the University of California, Riverside, developed an algorithm that detects fake news with 75 percent accuracy. Voice recognition is one thing, creating natural sounding artificial voices is quite another. Lyrebird - a member of NVIDIA’s Inception startup program - uses deep learning to take this a step further, with a system that's able to listen to a human voices and generate speech that mimics the sound of the original, human, speaker. We spoke with Lyrebird co-founder Jose Solero about the benefits of this technology, and why he feels the need to educate the public about what's possible. Dr. Kai-Fu Lee has been at the center of artificial intelligence for decades. Dr. Lee developed the world's first speaker independent continuous speech recognition system, selected as the most important innovation of the year by BusinessWeek, and that was back in 1988. In the three decades since, Dr. Lee has led teams at Apple, Silicon Graphics, Microsoft and Google. In 2009 Dr. Lee left Google to start Sinovation Ventures, which now manages a $2 billion fund focusing on technology startups in China and the United States. His latest book, "AI Superpowers: China, Silicon Valley, and the New World Order," ranks number six on the New York Times Business Books best sellers list. Intuit Senior Vice President and Chief Data Officer Ashok Srivastava on how the personal finance giant is using AI to help make us all smarter about our finances. When you hear of AI and machine learning, it’s easy to think of technology companies leading the charge. Capital One is determined to change that. In a conversation with AI Podcast host Noah Kravitz, Nitzan Mekel, managing vice president of machine learning at Capital One, explained how the banking giant is integrating AI and machine learning into customer-facing applications such as fraud-monitoring and detection, call center operations and customer experience. DOOM, of course, is foundational to 3D gaming. 3D gaming, of course, is foundational to GPUs. GPUs, of course, are foundational to deep learning, which is, now, thanks to a team of Italian researchers, two of whom we're bringing to you with this podcast, being used to make new levels for... DOOM. What's a meme? And what makes a meme, dank? Today's guest is Lawrence Pierson, a PhD student in theoretical astrophysics at Stanford University, will answer these questions, and more. He's the author a paper detailing how he and a classmate built a neural network to generate memes. Some of them are even funny. Robots following coded instructions to complete a task? Old school. Robots learning to do things by watching how humans do it? That’s the future. Earlier this year, Stanford’s Animesh Garg and Marynel Vázquez shared their research in a talk on “Generalizable Autonomy for Robotic Mobility and Manipulation” at the GPU Technology Conference last week. We caught up with them to learn more about generalizable autonomy - the idea that a robot should be able to observe human behavior, and learn to imitate it in a way that’s applicable to a variety of tasks and situations. Like learning to cook by watching YouTube videos, or figuring out how to cross a crowded room for another. Any sufficiently advanced technology is indistinguishable from magic. As the years have passed what passed since the invention of the personal computer, what passes in the world of technology has changed dramatically. So what’s next? Voice computing is once answer. Voice computing is one of the hottest and most fascinating areas of today’s’ technology landscape. Peter Cahill is the CEO of Voysis, an Irish startup using AI to make voice computing more realistic, and a part of more online retail experiences everywhere. Airport control towers are icons of the aviation industry. But a Canadian startup wants to use artificial intelligence to make them a relic of the past. Searidge Technologies believes AI powered video systems can do a better job. Credit scores are a funny thing. Funny might not be the right word, but you know what we mean. You can't have a credit score unless you have a credit history. You have to use your credit to keep your score up, but if your score's not good enough, you can't get credit. But never fear, AI and machine learning are here to help. Our guest on this episode is Ajay Gopal, he's with Deserve, a startup that's using machine learning to extend credit to people who may not have a typical credit history. NVIDIA researchers are gearing up to present 19 accepted papers and posters, seven of them during speaking sessions, at the annual Computer Vision and Pattern Recognition conference next week in Salt Lake City, Utah. Joining us to discuss some of what's being presented at CVPR, and to share his perspective on the world of deep learning and AI in general is one of the pillars of the computer science world, Bill Dally, chief scientist at NVIDIA. Smarts are always in fashion, and our next guest has that in spades. Costa Colbert has been chasing down how brains — both real and artificial — work for 30 years. Dr. Colbert — who holds degrees in fields ranging from neural science to electrical engineering — is known for his studies of information transmission in pyramidal neurons of the mammalian hippocampus and neocortex. At MAD Street Den his team is putting modern deep learning techniques to work for retailers in a wide variety of ways — including using Generative Adversarial Networks to create images of models wearing clothes. NetFlix has changed the way we watch television for the better. The streaming video pioneer is much more than just an entertainment giant for the 21st century — it’s also a pioneer when it comes to using machine learning. While Justin Basilico, a research director with NetFlix, can’t share all the spoilers, he knows better than anyone how entertainment and machine learning intersect. Think of it as like a USB port for your body. Emil Hewage is the co-founder and CEO at Cambridge Bio-Augmentation Systems, a neural engineering startup. They UK startup is building interfaces that use AI to help plug medical devices int our nervous systems. CBAS was named one of the top startups at Y Combinator’s Winter ‘17 cohort by TechCrunch and won the top prize with accelerator MassChallenge UK 2015. Wayne Thompson was into big data, before big data was cool. Now the world — even much of our GPU Technology Conference — revolves around the kinds of challenges the 25-year veteran of analytics software developer SAS Institute has made a career of helping enterprises master. How did that happen? We asked Thomson, Chief Data Scientist of SAS Data Science Technologies to talk about the big data, big models, and big computations driving deep learning, and to give us some perspective about what makes today’s deep learning technologies different. This week's episode features Bryan Catanzaro, vice president of applied deep learning research at NVIDIA, and if you've been following the podcast for a while, you know that an earlier episode featuring Bryan is one of the most popular podcasts we've done. Bryan is going to walk us through some of the latest developments at NVIDIA research... as well as share a story that involves Andrew Ng and cats. Grab the goods and go. AiFi co-founder and CEO Steve Gu wants to give every store — from Mom and Pop bodegas to supermarket chains — the ability to let customers saunter out of the door without so much as a wave at a checker. The benefits involve more than just convenience: stores will have a better idea of how their customers behave and get a real-time bead on their inventory. To do that, our latest guests and his team at startup AiFi rely on advanced sensor fusion, simulation, and deep learning. Clean, cheap fusion energy would change everything for the better. Our next guest, William Tang, has spent a career at the forefront of that field, currently as principal research physicist at the Princeton Plasma Physics Laboratory. He’s also one of the world’s foremost experts on how the science of fusion energy, and high-performance computing intersect. Now, he sees new tools — deep learning and artificial intelligence — being put to work to enable big-data-driven discovery in key scientific endeavors, such a the quest to deliver Fusion energy. Deep learning has helped machines understand how to move pieces around a board to master, and win, Go, the most complicated game mankind has ever invented. Now it's helping a new generation of chemists better understand how to move molecules around to model new kinds of materials. Our guest, Olexandr Isayev, an assistant professor at the UNC Eshelman School of Pharmacy, at the University of North Carolina at Chapel Hill, joined our show to explain how deep learning, Go, sci-fi, and computational chemistry intersect. How do you win a fast-paced first-person shooter? Answer: it helps to have a good GPU, of course. How do you win one of the world’s most high profile robotics competitions? You guessed it, it helps to have a good GPU. Doug Morrison of the Australian Center for Robotic Vision helped lead the team that developed Cartman, a custom-built, cost-effective robotic system that picked and placed its way to victory in the 2017 Amazon Robotics Challenge global finals in Nagoya Japan last year. We talk a lot about technology, and data, specifically, impacting all facets of modern life. In this episode we're going to look at data's role in addressing one of the biggest threats to life as we know it: cancer. We'll talk to Dr. Richard Wender, chief cancer control officer at the American Cancer Society about how technology is key to redefining how we look at, and fight, cancer. One of the things that makes the weather so dangerous is that it's so hard to predict. Tornadoes, hail, high winds and flash floods cause billions of dollars worth of property damage, and injure or kill hundreds of people in the United States each year. Knowing when storms may strike can save lives, and property. Our guest is part of a team at the National Center for Atmospheric Research that's doing just that. We spoke with David John Gagne, a postdoctoral fellow at the National Center for Atmospheric Research about his work with deep learning at the GPU Technology Conference in Silicon Valley this week. Accountants have spreadsheets. Novelists have word processors. Now, deep learning promises to help take some of the grunt out of legal grunt work. Here's how one startup is using deep learning to help lawyers get legal work done faster and more accurately. Ever since the internet went mainstream people have been struggling with perhaps the ultimate question: what do I call my web site? What domain name do I register? But almost as quickly as that became a question in people's mind, a secondary question came up: what's my domain name going to be worth? Well thanks to AI we have a better answer to that than ever. Joining us for this episode: Jason Ansel, senior principal engineer with GoDaddy, which is using AI to help you better understand the value of your domain name. Sarcasm? On the Internet? You're kidding. But sarcasm is no joke. Long before today's sentiment analysis systems struggled to accurately understand human communication, people struggled to understand one another's sarcasm. Now, thanks to the work of Dr. Pushpak Bhattacharyya and his team computers are beginning to understand one of humanity's most challenging, and amusing, modes of communication. Dr. Bhattacharyya, director of IIT Patna, and a professor at the Computer Science and Engineering Department at IIT Bombay has spent the past few years using GPU-powered deep learning to detect sarcasm. AI is being used to enhance and improve life in varied and often incredible ways. But what if we could use AI to improve the end of our lives, too? Our guest today is Anand Avati, a graduate student in the Artificial Intelligence Lab at Stanford University's Computer Science Department. Anand is co-author of a research paper entitled "Improving Palliative Care with Deep Learning" which details his team's use of a deep learning system to predict patient mortality with the aim of improving access to palliative care for critically-ill patients. AI is getting better, and it's finding its way into more parts of our lives with each passing day. And talking about the future artificial intelligence has become a surefire way to spawn a thousand debates about the future, and nature, of humankind ourselves. Our guest today, Ken McLeod, is an award winning science fiction author whose work dives deep into the relationship between man and machine. His latest book, "The Corporation Wars: Emergence" is the final volume in an acclaimed trilogy whose cast of characters includes sentient robots, computer AIs that oversee Earth from afar, and, of course, emulated human minds running in digital simulations. Love. The search for love. The search even for someone you just kind of like. It's been the subject of poems, novels, songs, you name it. For as long as humans have been around, they've been looking for love. But what if you could use AI to automate the process? To help you with everything from finding your true match, to swiping through all those not quite true matches. Oscar Alsing, our guest on this episode, will talk about how he's used AI, and Tinder, to do just that. Election polling is an inexact science. If you've been paying attention to American politics at all over the past year or two, you don't need us to tell you that. But what if instead of asking voters their opinions on the candidates or the issues you took a different approach, one that involves artificial intelligence... and cars. 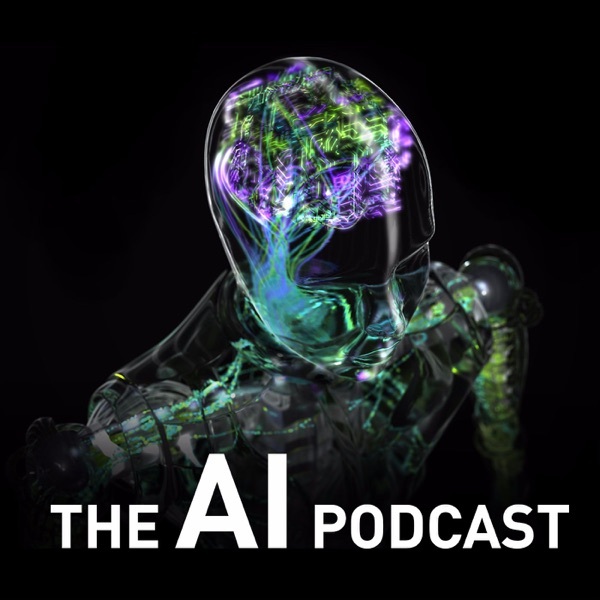 Joining us for this edition of the AI podcast is Timnit Gebru, a post-doctoral researcher at Microsoft Research in New York and a newly minted PhD from the Stanford Artificial Intelligence Laboratory. Timnit is co-author of a paper titled "Using Deep learning and Street View to Estimate the Demographic Makeup of Neighborhoods Across the United States." Think you've got no artistic talent? You do now. Vincent AI is an application that lets you pick up a stylus, sketch out a few lines on a screen, and watch as your scribbles are turned into a work of art inspired by one of seven artistic masters. We speak with Monty Barlow, machine learning director for Cambridge Consultants, the technology development house behind this amazing demo. Ever see a photo of an amazing looking meal, maybe in a food magazine or an Instagram feed, and wish you had the recipe to make it yourself? Thanks to a project born out of MIT's Computer Science and Artificial Intelligence Laboratory we're a step closer to being able to do that. We talk with Nick Hynes, one of the minds and stomachs behind this effort just in time for Thanksgiving and the holiday food season. Whether you're wandering through the sprawling virtual worlds of Grand Theft Auto... or just trying out a new couch in Ikea's virtual living room, virtual worlds are everywhere. But there's as problem. There just aren't enough artists to build all these virtual worlds and populate them with foes... or furniture. We spoke with Artomatix co-founder Eric Risser about how deep learning can help artists fill such burgeoning virtual worlds. Tired of waiting in checkout lines? Malong Technologies offers technology that may one day let you grab what you want and go. We spoke to this startup about how it's turning its prowess in some of the world's top image recognition contests into a service businesses can use to put image recognition to work. Picture this, you find yourself in a tattoo parlor. But none of the dragons, flaming skulls, or gothic font lifestyle mottos you see on the wall seem like something you want on your body. So what do you do? You turn to AI, of course. We spoke to two members of the development team at Tattoodo.com, who created an app that uses deep learning to help you create the tattoo of your dreams. This might be the first time we've been able to say this, but we might have spoilers ahead on this episode. Joining us we have Zack Thoutt, a data scientist and a developer from Boulder, Colorado. Zack has done something we've all wanted to have done: he's working on finishing the books behind HBO's Game of Thrones - a Song of Ice and Fire - by putting an AI system to work with sometimes comical results. The robots that have taken on tasks in the real world - which is to say the world where physics apply - are primarily programmed to do a specific job, such as welding a joint in a car or sweeping up cat hair. So what if robots could learn, and take it a step further - what if they could teach themselves, and pass on their knowledge to other robots? Where could that take machines, and the notion of machine intelligence? And how fast could we get there? Those are the questions our guest Sergey Levine, an assistant professor at UC Berkeley's department of Electrical Engineering and Computer Sciences, is finding answers to. The next time you don’t recognize a transaction listed on your monthly Paypal statement, rest assured: AI will likely identify the culprit and help ensure it won’t happen again. With advances in machine learning and the deployments of neural networks, logistic regression-powered models are expanding their uses throughout PayPal, Vadim Kutsyy, a data scientist at the online payments company, told host Michael Copeland on this week’s edition of the AI Podcast. We are here at the mothership of NVIDIA with this summer's Jetson interns. And Mokshith Voodarla, Mark Thies, Isaac Wilcove -- all recruited at top robotics competitions -- are building some amazing things with our Jetson embedded computing platform and deep learning, including a delivery robot, a robot that recognizes and disposes of trash, and a remote control car that can find people who are trapped in a building during a fire or earthquake. AI systems have been trained to take photos and transform them into the style of great artists like Van Gogh, Picasso, or J.M.W. Turner. Take a photo, pick a style, and what emerges looks kind of like the lost work of an artistic master. Now, AI is heading in a different artistic direction: music. The soaring music featured on today's podcast, which made its debut at our GPU Technology Conference, was composed by an AI system developed by our guest, Pierre Barreau, head of Luxembourg-based startup Aiva Technologies. We’ve heard of robots working in warehouses, picking the right windshield or a box of wiring harnesses from shevles. But what about making sure those shelves are stocked with the right stuff, in the right place, at the right time? Marc Gyongosi thinks that flying robots – better known as drones – are right for the job. Marc is the CEO founder of IFM, or Intelligent Flying Machines, which is pretty much what IFM does. Purple shirts, haircuts, and cats. How are these three all related? According to deep learning pioneer Andrew Ng, they all played a part in AI’s growing presence in our lives. Ng, formerly of Google and Baidu, and the founder of his new company, Deeplearning.ai, joined this week’s episode of the AI Podcast to share his thoughts on AI being the new electricity. Ep. 31: Could an AI Win the Nobel Prize? Our guest on this segment, Paul Wigley, of the Australian National University, was part of a team of scientists who applied AI to an experiment to create a Bose-Einstein condensate. And in doing so they had a question: if we can use AI as a tool in this experiment, can we use AI as its own novel, scientist, to explore different parts of physics and different parts of science? Tim Anglade, a consultant with HBO's "Silicon Valley," has engineered an app that solves an important problem for all of us: is that a hot dog... or not? The app was dreamed up by the writers and producers of HBO's hit comedy and brought to the real world by Anglade thanks to deep learning. We all know about driverless cars, driverless cars get all the love and all the attention, because we don't want to drive. But we're going to talk in this segment about autonomous trucks, how and why we need autonomous trucks in many ways just as much as we need autonomous cars. To do that, we're talking to Xiaodi Hou the CTO and co-founder of TuSimple, a company that is bringing driverless trucks to the road. We all know how far AI, and in particular deep learning, have pushed speech recognition, whether that is with Apple Siri, Amazon Alexa, or Google Assistant, Our guest on this segment, Syed Ahmed, is directing the power of AI towards another form of communication, American Sign Language. And what Syed has done is set up a deep learning model that translates American Sign Language into the English Language. Over the last few years data intensive machine learning solutions have supplanted rule-based software systems at many technology-based companies. Think about Amazon, Netflix, and Uber. But the gaming world hasn't exactly followed suit, at least not as quickly. Most games are still a delicate mix of hard-wired behavior in the form of traditional code, and somewhat more responsive behavior in the form of large collections of rules. Our guest, Danny Lange, VP of AI and Machine Learning at Unity Technologies, is taking a different tack, using deep learning to help with game creation, that subtle combination of art, story, and software. In recent years hedge funds have taken the lead in algorithmic investing - or robo-trading as it’s sometimes called. But there’s no reason the hedge fund world should have all the good stuff. In this episode of the AI Podcast, we speak with Gaurav Chakravorty, co-founder of qplum, a startup that’s working to bring that same machine learning investing approach to the rest of us. How an argument in a bar led Google's Ian Goodfellow to create Generative Adversarial Networks - deep learning systems that argue with each other - an AI breakthrough that promises to help researchers build systems that can learn with less human intervention. Whatever sport we follow, we all love a good highlight reel - and we want those highlights now. And whether they're following StarCraft II, League of Legends, or Heroes of the Storm, eSports fans are no different. To highlight the kills, and thrills, of a great eSports competition, Yale Song, Senior Research Scientist at Yahoo! Research, turned to AI. With self-driving cars generating so much buzz, it’s hard to believe that a self-piloting air taxi is, err, flying under the radar. But not for long. We spoke with Arne Stoschek, head of autonomous systems at Airbus A3 (pronounced “A-cubed”), the Silicon Valley-based advanced products and partnerships outpost of Airbus Group about a plan to bring a self-piloted air taxi to the Bay Area’s skies. We spoke with Xuchen Yao, co-founder of Kitt.ai, a startup using AI to build better chat experiences, about how voice and chat are turning into rich, interactive interfaces for a new generation of AI-powered services. Are AI and VR the peanut butter and chocolate of computing? Are they a match made in heaven? We spoke with Michael Ludden, who heads up IBM Watson's AI and VR labs, about how these two technologies intersect at this week's GPU Technology Conference. We spoke with Innit Chief Technology Officer Hristo Bojinov about all the surprising ways deep learning can help us better manage the very personal relationship we all have with food — from meal planning to kitchen inventory to cooking the perfect roast chicken. We spoke with the team at Marble, which has turned AI loose on the streets of San Francisco delivering food in San Francisco's vibrant Mission District. We spoke with Princeton researcher Aylin Caliskan, co-author of a headline-grabbing paper published in Science magazine earlier this month. Her paper details how learning machines can sometimes learn all too well, picking up our biases as well as our brilliance. Previous episodes discussed deep learning systems trained to master games like Chess, Go, and even Texas Hold 'Em. But training a deep neural net on a racing game like Mario Kart 64? What can you learn from that? A lot, it turns out, explains Kevin Hughes. If you're looking for the impact of deep learning, look to the end of your fork. We spoke with Blue River Technology co-founder and CTO Lee Redden about how the startup put deep learning to work tending 10% of the lettuce produced in the United States, and how deep learning promises to unleash a new agricultural revolution. We spoke with Michael Bowling, a professor at the University of Alberta whose team of researchers created a GPU-trained AI that has defeated professional poker players at heads-up no-limit Texas hold’em. The work promises to yield applications in the real world, where — unlike games such as Go and Chess — we often have to make decisions based on incomplete information. We speak with Matthew McKown, CEO of Conservation Metrics, about how deep learning techniques helped rediscover a bird that was once thought extinct, and how GPU-powered AI now helps biologists crunch vast quantities of data to spot trends that would have been impossible to detect before. We talk with Dr. Bradley Erickson, a Mayo Clinic neuroradiologist, who uses AI to predict tumor genomics using MRIs. His method could give doctors easier access to invaluable genetic information. Information that could predict how quickly a tumor will progress, and if it will respond to specific drugs and other treatments. Medicine — particularly radiology and pathology — have become more data-driven. The Massachusetts General Hospital Center for Clinical Data Science — led by Mark Michalski — promises to accelerate that, using AI technologies to spot patterns that can improve the detection, diagnosis and treatment of diseases. University of Kentucky Computer Science Professor Brent Seales caused a worldwide sensation when he and his team were able to use non-invasive scans to unlock writings on the ancient En-Gedi scroll to reveal the earliest copy of a Pentateuchal book — Leviticus — ever found in a Holy Ark. Now he’s turning his expertise to more ancient texts, this time from the lost Roman city of Herculaneum. If you want to bring autonomous vehicles to the mainstream, fast, first you’ve got to go fast. We spoke with Jonathan Cooke, chief marketing officer of Roborace, the first ever driverless electric racing championship, who wants to turn autonomous racing into a spectator sport that will spark the creation of more powerful, capable automotive AI. Cybersecurity is a cat-and-mouse game where the mouse always has long had the upper hand because it’s so easy for new malware to go undetected. Dr. Eli David, an expert in computational intelligence and CTO of Deep Instinct, wants to use AI to change that, bringing the GPU-powered deep learning techniques underpinning modern speech and image recognition to the vexing world of cybersecurity. Whether brewing hearty stouts or crisp lagers, flavor is a fickle thing. Not only is it hard to create consistently good brew, as humans our ability to identify - and remember - flavors is flawed. Yet brands worth billions rely on creating consistent flavors. We talk to Jason Cohen, founder of Gastrograph, who is using AI to help businesses that create beer, chocolate, wine, coffee, and spirits better understand flavor. It’s easy to think of AI as cold, unbiased, objective. Not quite, suggests Narrative Science Chief Scientist Kris Hammond explains, because we never know when AI will repeat our biases back to us. Take brains, a few hundred bones and a pink Barbie jeep. What have you got? For inventive hackers, a new sport filled with f-words -- fast, furious, frugal. Founder of the Power Racing Series Jim Burke talks about why he’s bringing autonomous vehicles to a racing event built on the backs of $500 kiddie cars. Deep learning promises to do more than just reshape city streets. We talked to Lynn Richards, president and CEO of the Congress for New Urbanism and Charles Marohn, president and co-founder of Strong Towns, about how. AI will do much more than automate driving. It promises to help create more liveable cities. And help put expensive infrastructure where we need it most. Autonomous vehicles will need to do much more than master object detection. Self-driving vehicles will need technology able to integrate visual computing, artificial intelligence, and high-performance computing, NVIDIA's Danny Shapiro explains. Deep learning isn't just for research scientists anymore. Hobbyists can use consumer grade GPUs and open-source DNN software to tackle common household tasks from ant control to chasing away stray cats. Bryan Catanzaro, vice president for applied deep learning research at NVIDIA, talks about how we know an AI technology is working, the potential for AI-powered speech, and where we’ll see the next deep learning breakthroughs. Think of our inaugural episode of The AI Podcast as a guide for the perplexed. Host Michael Copeland speaks with NVIDIA's Will Ramey about the history behind today's AI boom and the key concepts you need to know to get your head around a technology that's reshaping the world.